What was the favorite gift you received this Christmas? For me, one of my favs was this set of soup crocks. I had been asking for them for a few years. I didn’t think I was asking for something too difficult. Well, I finally got them from my teenage daughter! I thought it was fitting since we both LOVE French Onion Soup. When we go shopping in Wichita, we always try to stop at one of our favorite restaurants so we can enjoy a bowl. 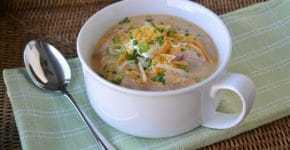 This is such an easy soup to re-create at home. I think it tastes even better if you make it the day before and then reheat it. Melt butter over medium heat in a Dutch Oven or soup pot. Meanwhile, peel and slice the onions in half and thinly slice into half moons. Add the onions to the pot with the salt and dried thyme. Reduce the heat to medium low and cook until the onions are caramelized and golden. This will take about 30 minutes Be sure to stir frequently so they don't burn. When the onions are caramelized, add the balsamic vinegar (or the white wine) and continue cooking over medium heat until the vinegar is almost evaporated. Be sure to scrape any browned bits from the bottom of the pot. Add the chicken both, beef broth, the consomme and the Worcestershire sauce. Bring to a simmer and continue simmering for 20 minutes. Season to taste with salt and pepper. I find that I don't need to add any additional salt. To serve: Toast the bread slices under the broiler. Place broiler safe soup bowls on a cooking sheet and ladle desired amount into each bowl. 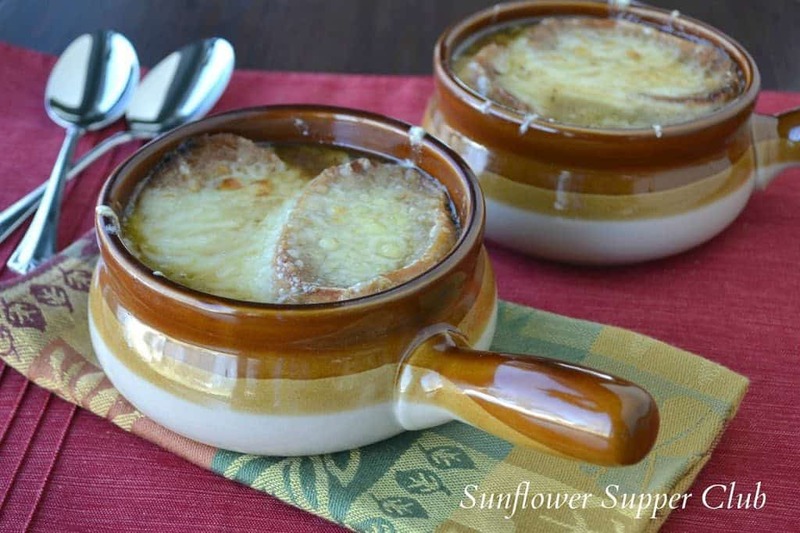 Top each bowl with a piece of french bread and a generous amount of cheese. Place under the broiler for a few minutes until cheese is melted and bubbly.